The Christchurch Earthquake has blown a massive hole into the insurance industry so renewing our house insurance this week meant paying double for our policy. It was an eye watering amount but one which we consider critical to protect out property should the worst befall us at any point in time. We rarely claim on our house insurance policies (broken camera lens and snow damaged house guttering are about all I can ever claiming in years) but when it comes to claiming on our pet insurance I seem to have established a close pen pal relationship with our insurers. It’s hard to believe that I almost didn’t bother, after all how much trouble could a couple of young hounds be? Our neighbors dogs are constantly at the vets being stitched up after doing battle with wild pigs. Our pampered pooches don’t live such dangerous lives but their health and well being is a constant worry. With so many long dangly bits and wide open eyes, it’s hardly surprising that they will be in the wars occasionally. 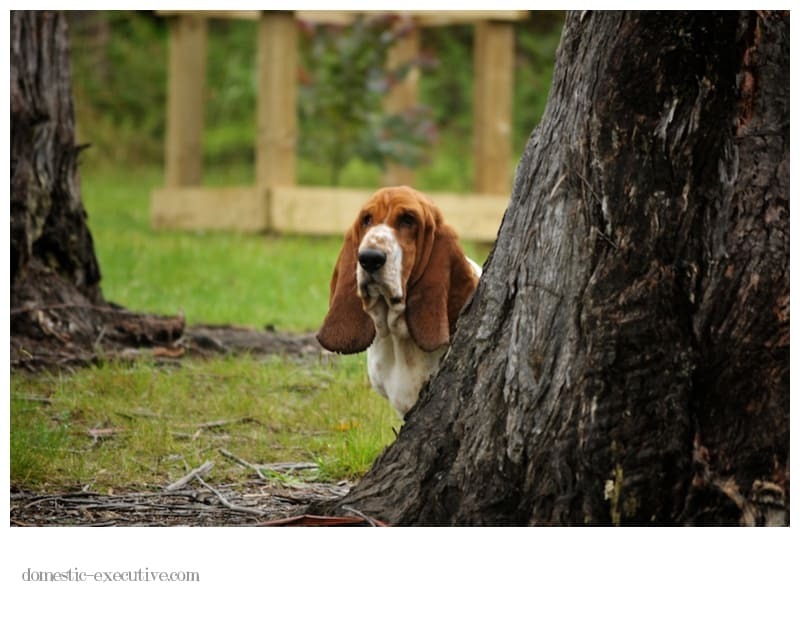 Once again Fortnum has been up to his fearless Basset tricks and injured himself after hooning down the garden breaking ground speed records for a dog on legs six inches in length. I didn’t see the actual moment that has caused him such distress but I suspect that it involved misjudged cornering on the slopes or wild acrobatics trying to outdo his much more agile brother. He’s clearly pulled/strained/injured something in his hind quarters although the vet has not ruled out an injury to his back. So he’s on enforced rest and banned from all manner of garden antics. 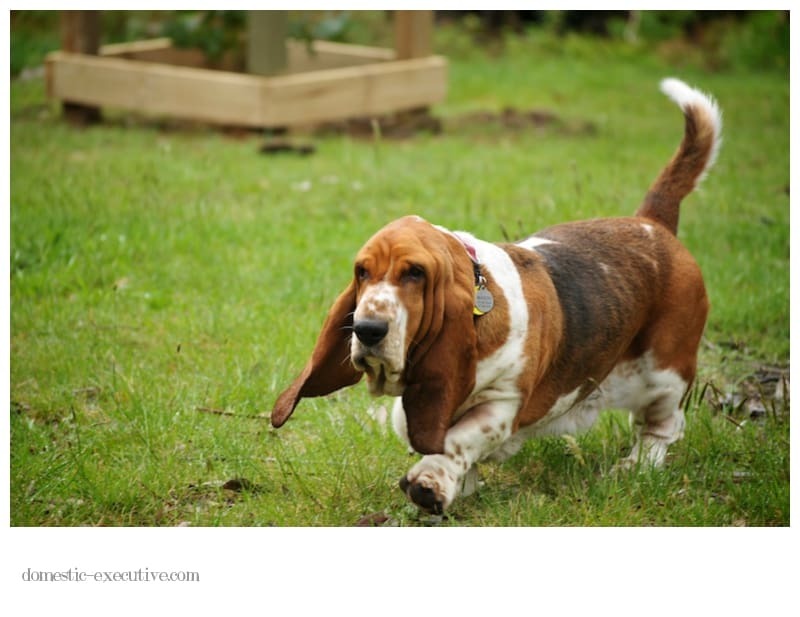 But when one basset suffers so does the other as Mason is left without a playmate. These hounds are inseparable most of the time and over time have developed a natural synchronicity which always amuses me. On a recent stroll I was able to capture the spirit of these mischievous hounds. 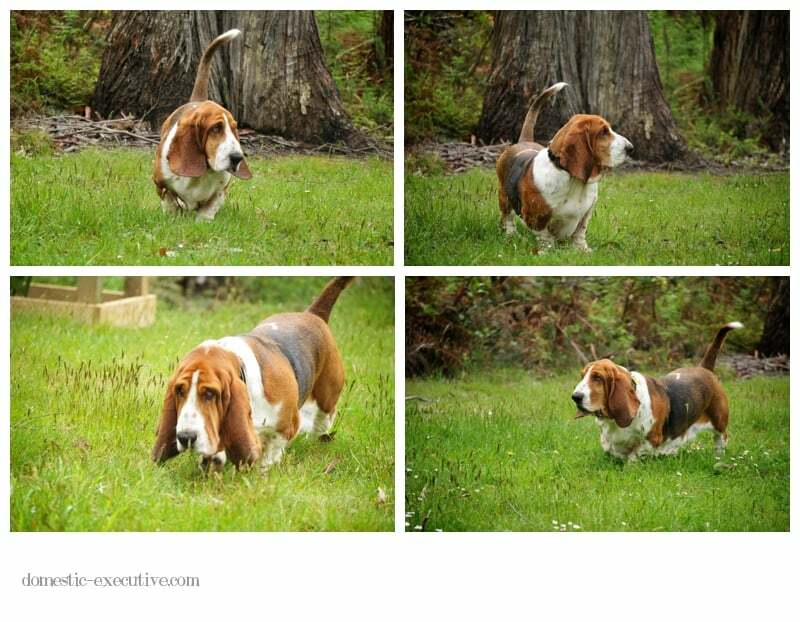 For once I was able to capture Mason in action although there was still a fair amount of camera avoidance going on which is not that helpful when the deadline is looming for the production of our 2012 Basset calendar. It always makes me laugh how Fortnum can go from hangdog hound to hunting hound in just a split second. They are adorable. After our boys (one with the golf ball removal surgery and the other with a slipped disc) now means pet insurers wont take us! Oh crikey, that would be a worry to not have them insured. Hoping that Fortnum doesn’t have a disc problem. Hope your pack are all well! I hope that Fortnum is healing up well and hasn’t had any complications. Basset do tend to have back problems, I suppose you could consider it a flaw in their engineering. You got some wonderful captures of the ever camera shy Mason, it’s so nice to his handsome mug posing for a few shots.